Getting engaged is one of the happiest and most exciting times for a couple. 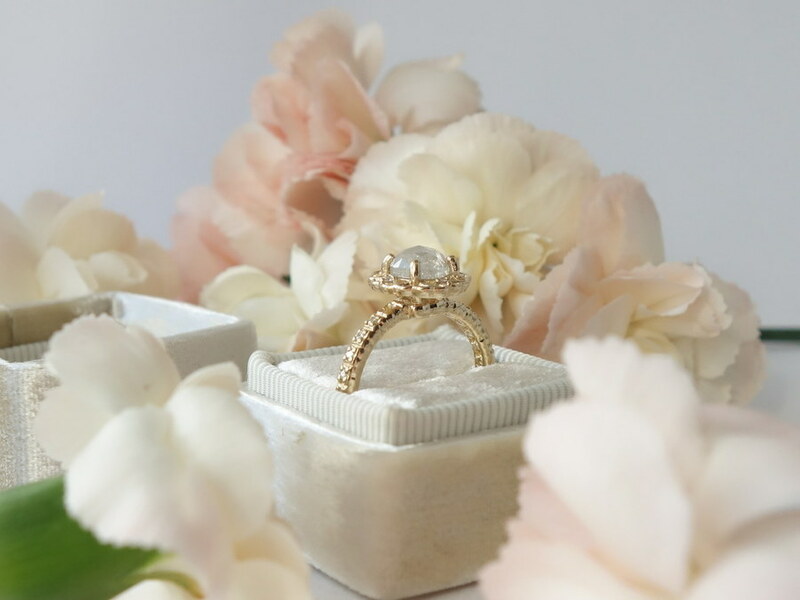 Every person has different preferences on how engagement ring shopping should go. For us, it went better than we could ever have imagined. 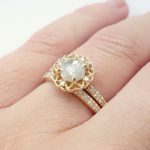 So you could read about our story below, or you could just skip to the tips on shopping for engagement rings online here. When it came to an engagement ring, Craig and I had very specific tastes. We knew we didn’t want anything that looked like it came out of a Zales commercial. We wanted something that looked antique, but we didn’t want it to look old. 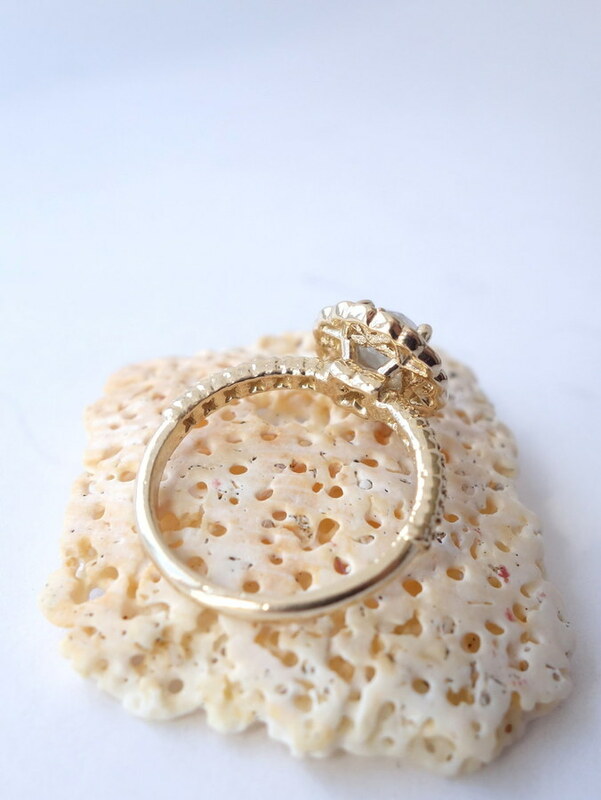 Our aesthetic requirements alone made the task of going from store to store looking at rings a daunting expedition. We liked the idea of something that was unique. I often tell people about the first time we went ring shopping. I remember seeing soooo many rings at the time. They were all so beautiful. Each one sparkled so much they made my head spin. But if you asked me which one stood out to me as my favorite, I couldn’t tell you because they all looked the same. I also wanted to know that my ring was responsibly created. The diamonds had to be conflict-free, and I was also open to non-diamond engagement rings. 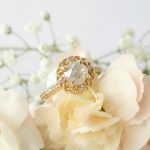 Ideally I wanted the company we would buy my ring from would would be conscious of their impact on the environment, both socially and environmentally. And this last thing was optional because I figured it would be rare, but I wanted to connect with whomever created my ring. I’ve always had a bit of an artistic temperament, so I appreciate the work of other artists. And when I can connect with an artist who’s created something that I’m going to purchase, that makes me feel good. In my case, I was in the early stages of ring shopping when I discovered Kate Szabone’s Etsy store. I love that nature inspires her design aesthetic. She doesn’t just use colors found in the wild, but she also uses textures as well. Texture is something I don’t see reflected in a lot of retail store designs. 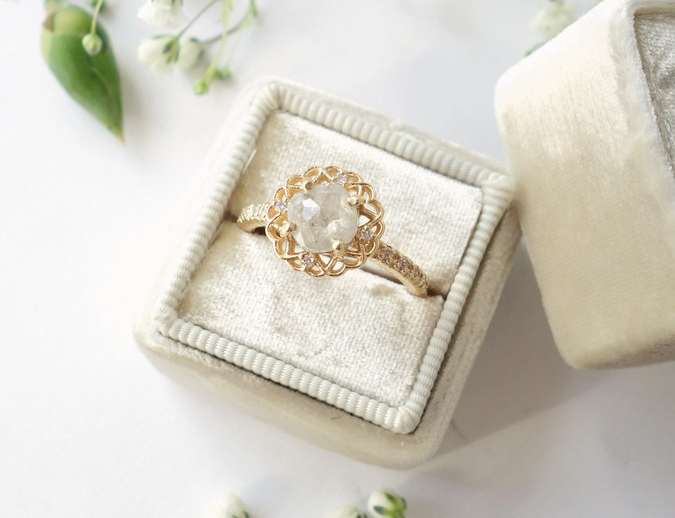 When I first saw the Lily ring, I was intrigued. But it wasn’t until I saw the profile of the ring that I was completely taken. 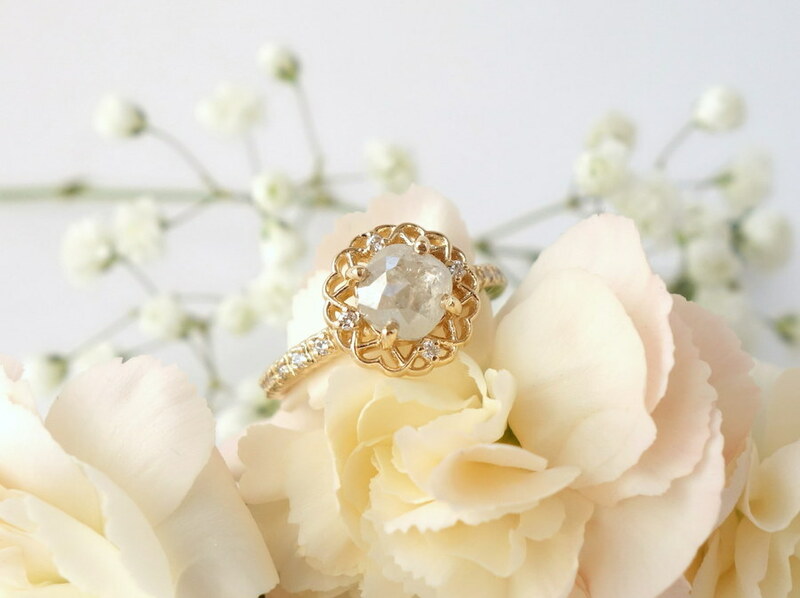 The center stone, a 1.23 carat cushion rose cut natural diamond, is surrounded by open lacework set with 4 additional diamonds. The setting reminds me of a vintage ballerina style setting. The band has 10 more bezel set diamonds to complete the look. I messaged Kate and I said I was interested in the Lily ring. I asked her about resizing it and about the matching wedding band. She was very friendly, helpful, and even open to my ideas on the wedding band. Knowing I could converse directly with the designer and her assistant eased my nervousness. The one that captured my attention. With its matching wedding band. After much deliberating, we finally decided that this would be the ring. What ultimately tipped our decision? A promotional video about her business and her jewelry that she had posted on her Etsy store. I got to see the inside of her shop and how she worked. It gave me a glimpse into what it took to create my ring. 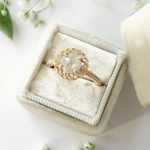 And even though it was more expensive than the other ring we were considering, seeing the craftsmanship that went into her jewelry made that additional $700 worth it in the end. Now let’s say you’ve already done your engagement ring search. You’ve gone to the stores, seen rings in person. Out of all the rings you looked at, the one that you’ve fallen in love with is online and either in another state (or even another country). Do you take that chance and buy it? Here are a few tips that will help you decide. Jewelry designers, especially if they have an online shop or website, should have their portfolio of work online. Review their portfolio. If their work mostly consists of 3-D renderings rather than finished and styled pieces, it could mean they don’t have a client base yet and no finished pieces to show. While this isn’t necessarily a bad thing, this could indicate a lack of experience. This is an example of a 3-dimensional rendering of a piece of jewelry. Rings on a plain neutral background and no objects in the foreground or background. Rings that seemingly “float” on the background or in mid-air. Note: Sometimes jewelry photographers can achieve this in real life using dots of glue, but there will usually be other objects in the photo. If each piece is displayed in a variety of ways, that’s a good sign. 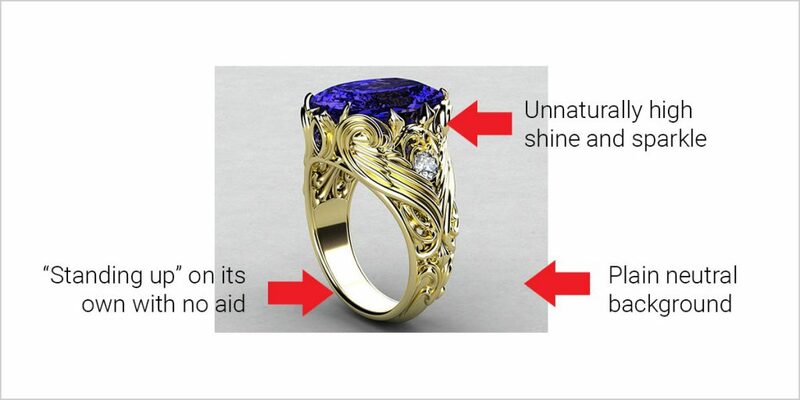 For example, let’s say you can view a ring’s 3-D rendering, a photo of the ring styled for marketing purposes, plus a photo of the ring on a human hand. That indicates not only did the jeweler design the ring, but they took it all the way to creation and display. In this particular example, this designer uses a variety of scenes to display her finished pieces. 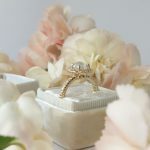 I wouldn’t say the jeweler’s social media presence has to be broad, but I think it should certainly extend beyond their own online shop. And for a jewelry designer, it’s probably best that they focus on social networks that make sense for their business. Networks such as Pinterest, Instagram, and Facebook are good starters. Check out how often they post and what they post about. An 80/20 mix of “front of house” vs. “back of house” content is ideal. Front-of-house content would be like new designs, while back-of-house content would be acquiring new design software or other behind-the-scenes stuff. 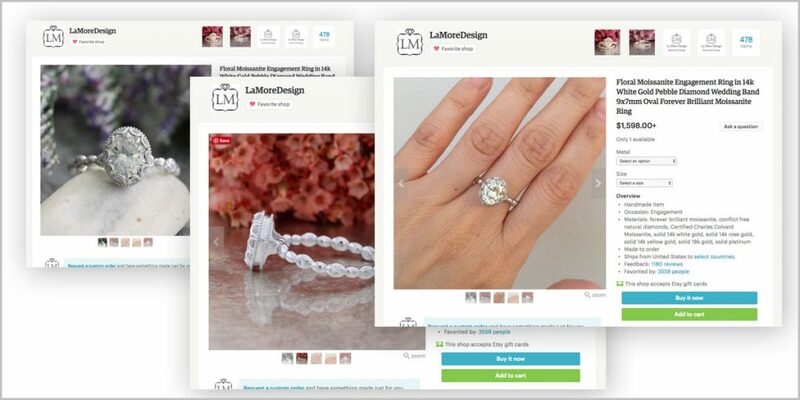 Look and see if they respond to customer comments or questions on their social networks. That can be an indicator of how focused they are on their customer care. 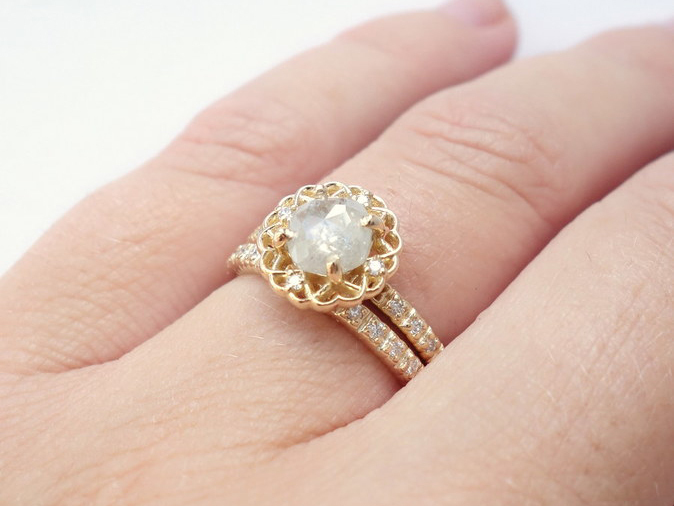 A jewelry designer should want to answer all your questions. They should already have all of their shop policies outlined on their website (because you reviewed them word for word, right? You should always do this!) However in case they didn’t cover something you were curious about, send them a message or better yet, call them. If they offer a business number on their website, by all means use it. Nothing compares to speaking to a human when vetting a purchase like an engagement ring. Jewelry designers are, in some shape or fashion, artists. All artists are inspired or influenced by something else whether it be another artist or a specific style. When asked about what inspires them, they should be able to give you an answer and that answer should be reflected in their work. Ultimately you want someone who has insight into the work. When they have passion for the trade, you know they’re the one that had their hand in creating it. 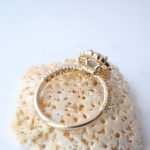 What it boils down to in the end is this: whatever you choose will be the ring your partner gives to you when he or she asks for your hand in marriage. No one can tell you what feels right to you. When you see the ring, you just know it. Just like when you and your significant other first met.